This page is now archived. View the HCS2010 Report and Gallery, please jump here. 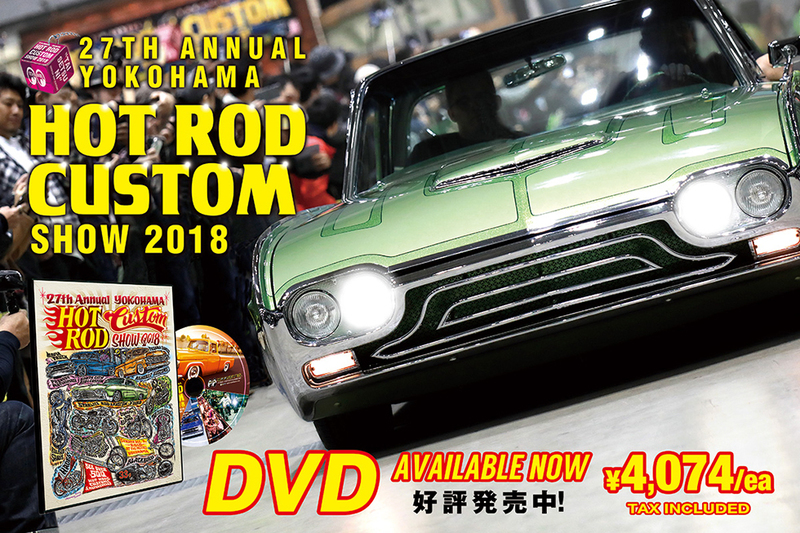 December 5, 2010 (Sunday) Hot Rod City Yokohama, Japan at the Pacifico Yokohama International Exhibition Hall Pacifico's website has great information on accommodations too. ADVANCED SALE HCS TICKETS are available for order online here. Coming to Japan for HCS2010? Be sure to order your tickets in advance! You will be able to purchase tickets to the Little Get Together Party the night before the show! Speaking of the night before the show... DicE Magazine will host a Late Night Little Get Together after the party but be warned, we heard last year was such a blast that a few people missed half the show on Sunday. As Matt an Dean would say, "Oh bloody hell, it's one big weekend of partying mate!" Cruisin' Magazine (Japan) HCS2010 Preview/Showcase! A year in the making, maybe more. MOONEYES has been in contact with two very talented fine artists. Both of them are in their own league and one was a fundamental ingredient to the Low Brow Art movement and created ART JUXTAPOZ magazine. Both are married, both are hot rod enthusiasts, and both are life-long car lovers. We are talking about Suzanne Williams, a contemporary fine artist of abstract expressionism with symmetrical balance work and '34 Ford Tudor Sedan owner and Robert Williams, a living legend in the Kustom Kulture movement, Low Brow mastermind artist that bridges the gap of realism and surrealism and owner of a '32 Ford Roadster painted in the scheme of his childhood memories of circle track racing in the south. Both artists and both cars will be at HCS2010. That's not all! There are big plans for this occasion. The show in December will feature an art exhibition from artists in the industry that have been influenced by them called Tribute to Robert Williams & Suzanne Williams. Suzanne Williams (left) & Robert Williams (right) pose with their cars. Photo used in MIM#5 which features a good intro article on their life and art. The '34 Ford Sedan owned by Suzanne Williams features a gray painted body, old school hot rod style and well kept even though it's a daily driver. On the other hand, the '32 Roadster is a replica of the early days of circle track racing in the south where bold colors were a way to stand out and be identified from the stands. This original roadster has been in the hands of Robert Williams for 4 decades. It's currently named "Prickly Heat" with a number 397 tagged on its sides. Its previous life was an old school hot rod style like the Sedan called, "Eights & Aces". This 1936 Ford Coupe changed the way the industry looks at Kustoms as a whole. Initially clean stock Ford, Cole Foster fine tuned it to perfection and then displayed it in bare metal for the world. Now complete and dipped in deep gloss black, the coupe makes its way to Yokohama. At first glance, a viewer may think it's just a chopped '36 with fender skirts but there are so many fine tuned details the difference is staggering. From the massages body lines to the glass tail lights, this is what builders aim for when trying to achieve a show quality custom. The car was built for Metallica band member Kirk Hammett thus the name "Metalli-Coupe". Mini Truckin' Magazine editor Mike Alexander & No Regrets CC member Steve Wilk will be on the scene and heading the new section called, "Street Truck Slammed Zone" featuring small and large trucks laying frame and what ever else(!) "Green Inspiration" was a recent showcase and has been making the rounds in the USA. Not as common as what most people think of when they picture a mini truck, this Chevy S10 sits on Supreme wheels and skinny white ribbons topped off with scallops of the 60's flavor. Other touches include the spotless interior and extremely clean engine bay. MUST SEE! Check out MOON ILLUSTRATED MAGAZINE Vol. 5 for details about featured guests and be sure to order your copy today! MIM#5 is available for order at our online store or directly at our shop both here in Japan and available at our shop in Santa Fe Springs, California as well. PHOTO ARCHIVES 18th Annual Hot Rod Custom Show (Dec. 6, '09) >> DVD / MIM 17th Annual Hot Rod Custom Show (Dec. 7, '08) >> DVD 16th Annual Hot Rod Custom Show (Dec 2, '07) 15th Annual Hot Rod Custom Show (Dec. 3, '06) 14th Annual Hot Rod Custom Show (Dec. 4, '05) 13th Annual Hot Rod Custom Show (Dec. 5, '04) 12th Annual Hot Rod Custom Show (30 Nov. '03) 11th Annual Hot Rod Custom Show (1 Dec. '02) View the official event information page for HCS2010 (in Japanese)! Archive Updates. As we constantly update this page getting closer to the main event in December, we'll keep news archive here for reference. If you missed an update, you can review it below. ....continuous updates... (UPDATE: 7/10) Road Dog Customs Sonny Boy from Santa Fe Springs, California will be attending HCS! We have also confirmed more guests including Hippodrome Studio Jeff Decker, DicE Magazine Dean Micetich and Street Chopper Magazine editor Grant Peterson each bringing one of their latest bikes. (UPDATE: 8/07) From Downtown Los Angeles, California - Ian Barry - Falcon Motorcycles will be a guest to the Hot Rod Custom Show this year bringing along their last Triumph based build, the Kestrel Falcon. (UPDATE:5/31) Ron Covell, master craftsman and metalworker whom was unable to make it last year has already confirmed to MOONEYES that he will be there this year! Also, all the way from Italy, The Blaster! The crazy Italian pinstriper came to HCS last year for the first time and had such a blast (pun, sorry) that he has made sure to let us know he is coming again, for more. (First published May 27, 2010) Feels early to announce? Not so, December will be here before you know it and MOONEYES always begins in early Spring as there's much work to do in the pre-stage of planning. This year is no exception with huge names in the industry and stunning cars that are already lined up. A year in the making, maybe more. MOONEYES has been in contact with two very talented fine artists. Both of them are in their own league and one was a fundamental ingredient to the Low Brow Art movement and created ART JUXTAPOZ magazine. Both are married, both are hot rod enthusiasts, and both are life-long car lovers. We are talking about Suzanne Williams, a contemporary fine artist of abstract expressionism with symmetrical balance work and '34 Ford Tudor Sedan owner and Robert Williams, a living legend in the Kustom Kulture movement, Low Brow mastermind artist that bridges the gap of realism and surrealism and owner of a '32 Ford Roadster painted in the scheme of his childhood memories of circle track racing in the south. Both artists and both cars will be at HCS2010. That's not all! There are big plans for this occasion. One is a Preview of sorts to what will be featured and exhibited at the show in December. The show in December will feature a large exhibition of artworks from both artists as well as people in the industry that have been influenced by them. It is a Tribute to Robert Williams. The Preview of a Tribute to Robert Williams will be held at MOONEYES Area-1 in August 2010. Stick around for more details to come!